Monday: Couldn’t get a spinning class at Europa Pools but managed to get a space in Barbara,s class at West Kirby. Had half an hour in the gym beforehand doing a few weights. Rowing and the Arm pedaling contraption for 6 minutes @ level 6. It was a full class and then another two came in. These days I don’t waste any time turning the legs over waiting for the class to start. I need to increase my pace if I’m not to get dropped by the North End. So flat out it was, 836 calories worth with a Maximum Heart Rate of 185 BPM. 55 minutes worth of on the limit spinning. First class of the week, what with the rides at the weekend it promises to be a fruitfull week. Tuesday: On the reserve list for Europa Pools spinning class, the early one. Got to Europa Pools early to get a place as it was there were 3 bikes left when the class started. Went the gym beforehand to do a set of weights. 680 calories burnt which was a surprise as it was nothing like the previous nights class. Average pulse was 132 for an hour and five minutes. Before that I’d done a couple of miles on the Toy with my new shoes on and the levers in there final position. Wedneday: Ride day, got to do my own thing as I have a dental appointment in the afternoon. A Steve Cummings training ride might be a possibility If I set out early. as it was I did a Wirral circular route of 48 miles. Good weather made for a good ride. Spinning at Europa Pools also. It was Sarah’s class tonight as Sheila is still on sick leave after doing her foot in on the step class. Was told I was the talk of the class on Louises second class. Take heart there are no bad classes, the classes are what you put into them. I measure what I put into a class. Just doing a class means you arn’t out there doing something that you normally shouldn’t be doing. Anyway back to the class, it’s hot. 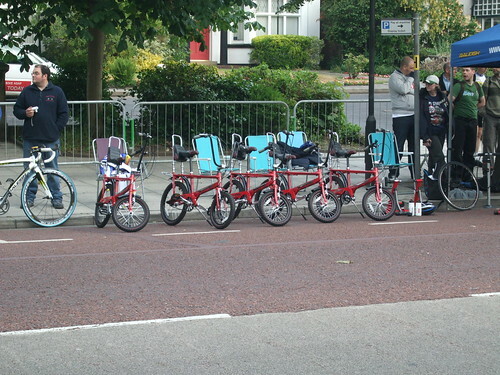 A lot haven’t turned up as the rollcall still leaves 6 empty bikes. We are all thrown by Sarah,s routine, different music and a new style can throw anybody. Sarah has already been contacted by the Luddites about the routine and she is only standing in for Sheila. The whole point of a routine is to vary it, variety is the spice of life. Take Barbara,s classes. I can do one of these on autopilot. Barbara does a LOT of classes and if you only do one or two it feels like a tough workout. If you do five a week it doesn’t, I could do it so to speak. The music plays and you know what is coming up it’s got to the stage where I’m doing the routine to the tune. Anyway back to Sarah,s class 500 calories but the whole thing is that it was a DIFFERENT routine. Forgot my towel which didn’t help. Had some news of Steph from one of the other spinners on Tuesday, she,s in good form and having the time of her life by the sound of things. Steph took classes at the Oval. Thursday: Louise,s class at Europa pools just as it turns out I hadn’t booked. Two new girls in the class and I’m next to them. This pair look like they are going to struggle as they haven’t a clue what they have let themselves in for. I was going to ask them which one put the other up to it. Before you all come down on me like a ton of bricks read the Spinning page. I spoke to the girl next to me twice about the level one setting as it hadn’t sunk in. She had turned the resistance out by about 6 turns so there was no way she could ever get it back. A quarter turn of nothing is still nothing. The thing is one of them said to Louise that they found the class EASY!!! they did absolutley nothing !!!!!! ( exclamation marks are my least form of objection) . The girl next to me nearly came out the pedal as she had no resistance in. Louise came across but they still haven’t twigged it’s all about the resistance level. I say all this as I know we will never see the pair of them again. As for the rest of the class we all know who is kidding and that is no one. I’m the only bloke again in the class but all of these girls give it a good go for 45 minutes. 660 calories by the time I had cleared a few bikes away, shower , home. Hi 164 BPM. Friday: Booked in for Sarah,s class and the prospect of a Steve Cummings training ride. Sarah,s Class at Europa Pools 540 calories but I did have the fan on me for most of the class as there were only seven of us. Sarah offered to do a tougher class next week!!! but we declined as the classes are as tough as you make them. Sunday: Ice cream farm with the NorthEnd and a Wirral Loop as we were back at the Eureka for 10 past 1. 82 miles. Grand Total for the week 295 miles. Monday: Louise,s spinning class at the Oval 650 calories. Spoke to her about the warning I’ve put on the site for beginners. Weights and crosstrainer before the class. Wednesday: Highlight of this gym session was the rowing. 2 Kilometres in a new personal best of 7:35.5 this is what I’d call hard work. Weights (nothing above 50Kg in case anyone is interested) and ran a kilometre @ 10k/hr. Thursday: This was all about the treadmill, jumped on it and ran 2k @ 10 k/hr 0.5k walk @ 6 k/hr 0.5k @11 k/hr with the final 0.5k @12 k/hr. Didn’t forget the weights and jumped on an exercise bike for the first time in a long time just to see what it’s like. This felt like it was broke, I was mashing away at level 23 (Max) at just below 60 rpm. Reducing the resistance level only brings home how far I’ve come in the last year. A year ago I was afraid to enter a place like this, came to afternoon sessions when it was quiet when I finally plucked up courage to enter the place. Sad really that a 46 year old bloke alters his lifestyle because of what he thinks others perceive of him. That was last year, this year is a totally different ballgame. You wouldn’t recognise me from last year, it’s happening far too often for it to be a fluke. Now the gyms a strange place at times, we are all there for the same reason but you would think it was a library at times. Nobody talks, and with the advent of Ipods it’s just got a whole lot worse. I’ll talk to nearly everybody these days, if your there you’re having a go which is a far cry from the state I was in, vegetation. I still don’t know what to do with the rest of my life, much has emerged over the last year. There seems very little out there for blokes in a similar position to me. This is further compounded by what I see around me, money doesn’t buy you much other than a 4×4 and a Costco membership. Now the cost of a Costco membership is about £35 so we are all equal as we walk through the door. Pity it attracts the sort of people that plonk a 4×4 in a disabled parking space. Friday: Sheila,s spinning class at Europa Pools. Now the three new girls that turned up last week are suckers for punishment and they have turned up again. This was a hot class and Sheila mentioned the importance of getting your hydration right. One of the new girls had her leg go on her and slipped on the bike. I hope it hasn’t put her off the classes. One of the regulars had done 5 classes that week that’s some going. 550 calories burnt, it was probably more but I still have the odd problem with chest strap. Max heartrate was 168 BPM. Sunday: a herd of cows had me meeting up with one of the 1500 readers of my blog this month. I was out on my ride to the Eureka but everything stops when the cows get put in the field at the bottom of Redhill. Here I bumped into Claire who does a circuit of Route 56. I’d mentioned the weightloss and it turns out Claire and her husband had come across the site and between them they have lost 5 stone. It really is a small world and I’m amazed that my success is starting to inspire others to have a go. At Thornton Hough we go our seperate ways as there is a breakfast that I need in me before the ride. Incidently my weight this morning was 82.1Kg, subtract that from 132 Kg and it comes out at a weight loss of 49.9 Kg 100g short of the magic 50 Kg or 110 lbs a phenominal amount. To put it into context it’s the same weight as two bags of plaster or cement. The suitcase weight limit for Easyjet is 22 Kg, the last time I flew with EasyJet I’d lost 22 Kg or a suitcase worth and it hit home hard when you have to lift the things onto the scale. More than two peoples baggage allowance starts to blow the mind. Fast forward to the Eureka, todays ride was to Marford and all in I ended up doing 65 miles. Maybe a write up later. Turned out to be a good week.